Posted on 5/4/2011, 3:42 pm, by jungrrl, under General Projects, Holidays. Did you know today is Star Wars day? It’s true! 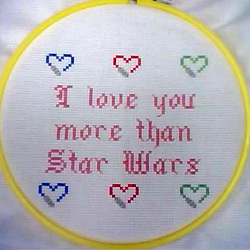 Craftsters LOVE Star Wars and have made so many amazing Star Wars crafts! From the most popular characters, to the most obscure, Craftster have done it all. Take a look at just a few of the great projects from around the forums and May the Fourth be with you! Don’t forget to check out the Star Wars tag for more amazing projects!